The Australian dollar attempted to extend its rally today, but gains were limited, and the Aussie has lost them by now. Consequently, the currency was trading either flat or lower against its major rivals. However we doubt whether this welcome lift to confidence will be sufficient to see the Bank achieve its ambitious growth forecast in 2018 of 3.25%. We confirm our view that the cash rate is likely to remain on hold at 1.5% through 2018. 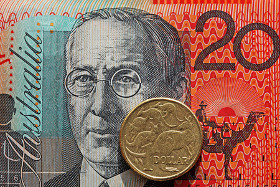 AUD/USD opened at 0.7556, rallied to the high of 0.7580 intraday, but retreated to 0.7558 by 10:08 GMT today. AUD/JPY traded at 85.71 after opening at 85.79 and rising to the daily high of 85.96.